Alco PB-1 locomotive 600B (6002). Rebuilt as Steam Generator car 253 in 1966 (prime mover removed; radiator panels removed; two boilers installed). The Alco 3-axle trucks were replaced in 1980 with 2-axle EMD Blomberg trucks. Photo from January 1982. SD7 No. 5303, parked at Burnham opposite the shop, i.e. on the dead line. This first-generation 6-motor unit was built in 1953. 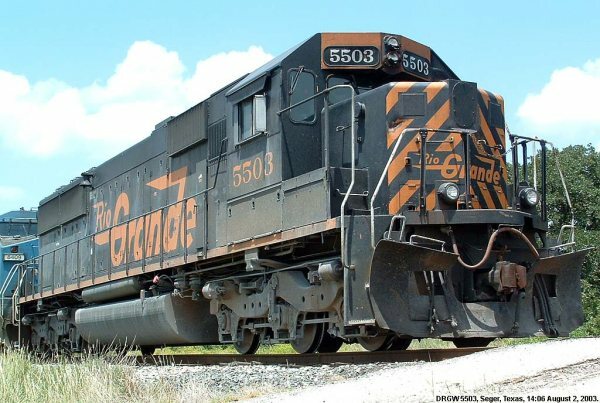 Here it wears its second and last-ever D&RGW paint scheme. Courtesy of Doug Junda. SD45 No. 5315, westbound at East Portal in Spring 1968. 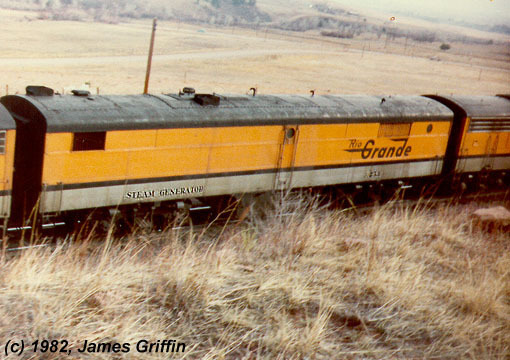 She is the lowest-numbered SD45. SD45 No. 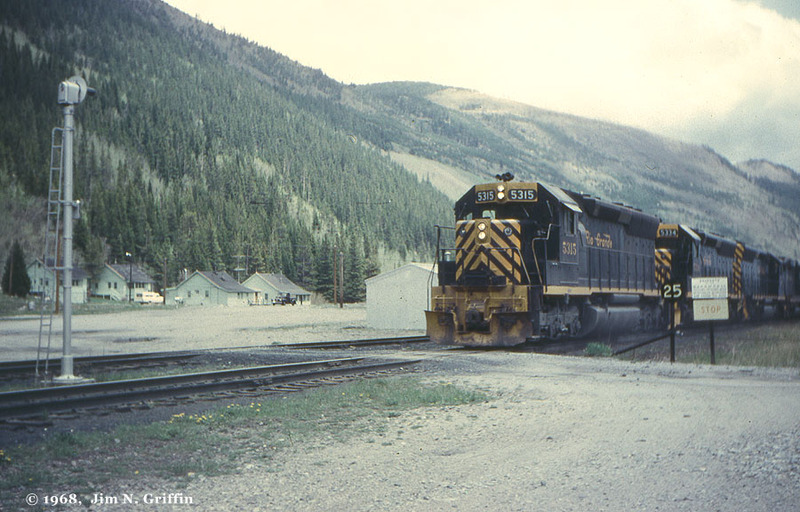 5316, seen at Coal Creek on 4/08/1984. It’s splicing two pairs of tunnel motors, the five of which are leading the CSDPU train. Unfortunately I have misplaced the negative to this photo, leaving only this deep scan of the print to work with. The unit wears the small (original) Rio Grande herald. SD45 No. 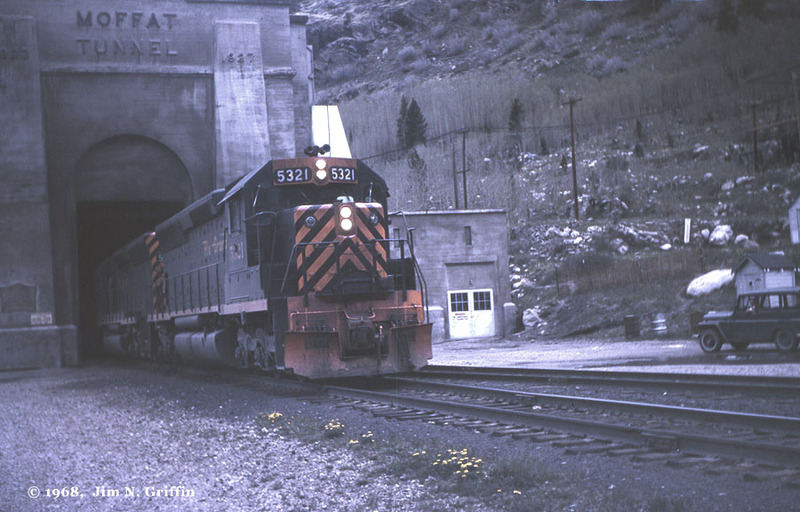 5321, eastbound out of the Moffat Tunnel sometime during Spring 1968. She is slightly over one year old in this photo. Bottom: Here she is, in a grab shot as she races through Deming, NM on a rainy September 3, 2006. 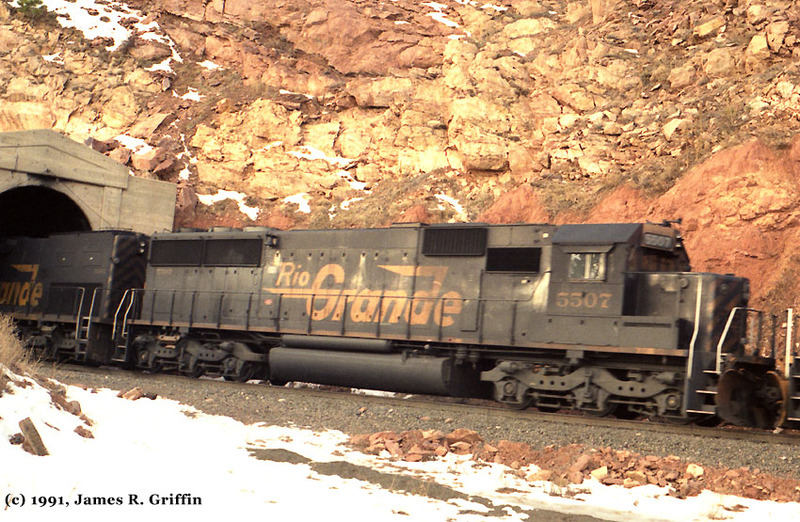 Not many units left showing any Rio Grande paint in 2006, so this was a nice surprise. Emphasis on “surprise”- I barely had time to get the camera out of my lap! Low nose Pyle light has been removed and blanked, as well as the class lights, with little cosmetic effort. Addition of ditch lights, mounted above the deck line. Horn has been removed from the cab to the middle of the long hood. Bell mounted high on the right side of the long hood. “Mail Slot” battery box cover, visible in the third image. 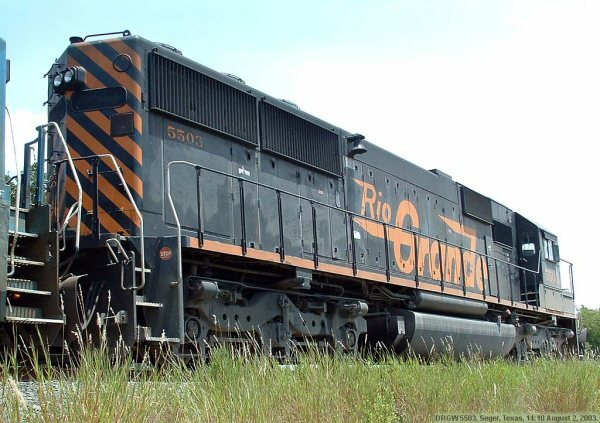 Jumbo plow, larger than most other Rio Grande models (except for the three GP60s). The plow merely looks black. Under all that grime is a standard coat of Grande gold. Small unit numbers at rear edge of the long hood. This practice began with the tunnel motors, which had no rear number boards. 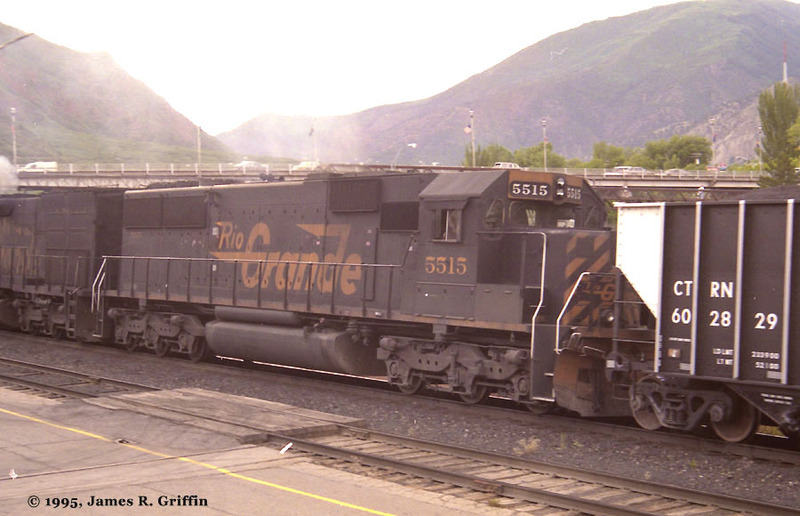 Rio Grande continued it with the SD50 series, even though there was a lighted number board just around the corner. Top: SD50 No. 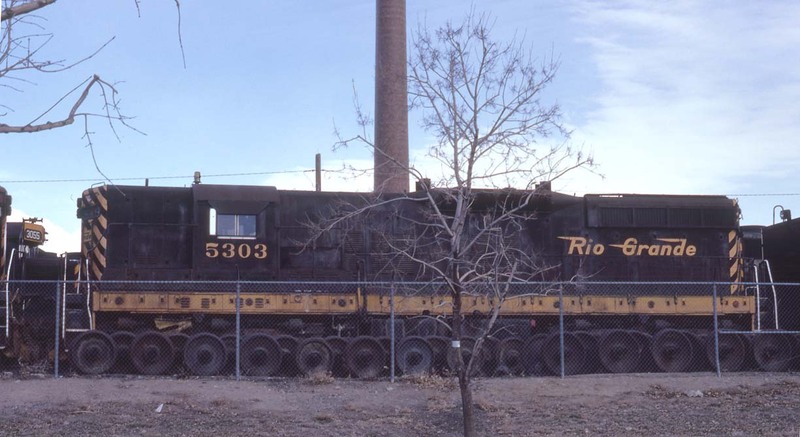 5506, November 19, 1990, on the departure track at North Yard (Denver). 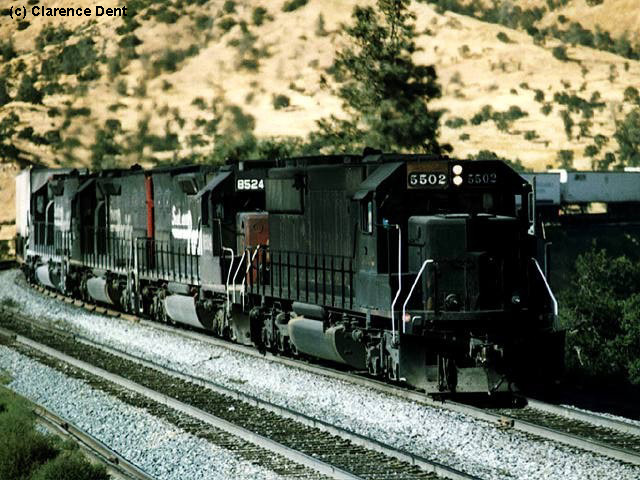 Bottom: Here it is during the late Southern Pacific era (circa 1995), working in California along with fellow SD50 No. 5514, which had been repainted in SP colors by then. (Clarence Dent photo. )The 5506 was repainted as UP 5100 on Sept. 4, 2001. SD50 No. 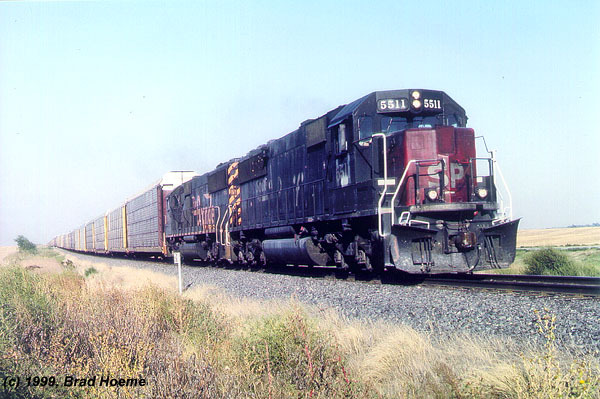 5507 is seen on Nov. 20, 1991 at Tunnel One, as the fourth unit from the front of a loaded coal train. 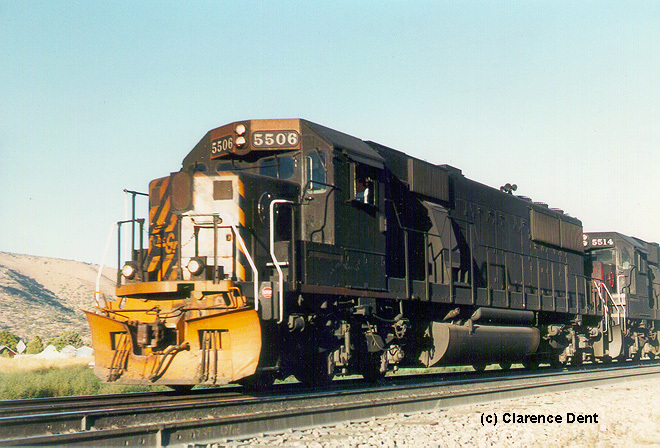 The 5507 was the last SD50 to remain in original D&RGW colors, finally being patched as UP 9851 on August 3, 2005. SD50 No. 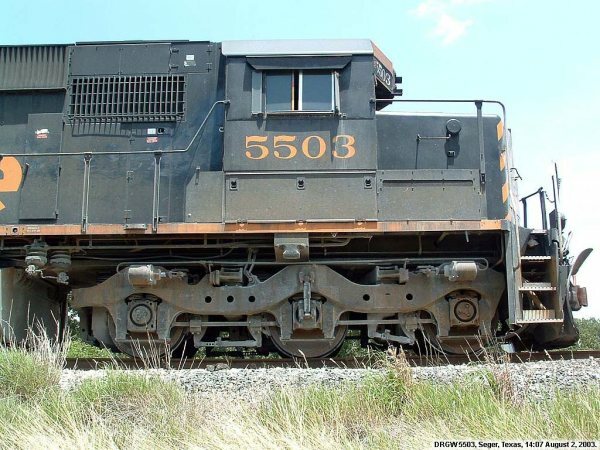 5511, wearing its Southern Pacific camouflage, is seen in Kansas with a sister SD50. Brad Hoeme photo. 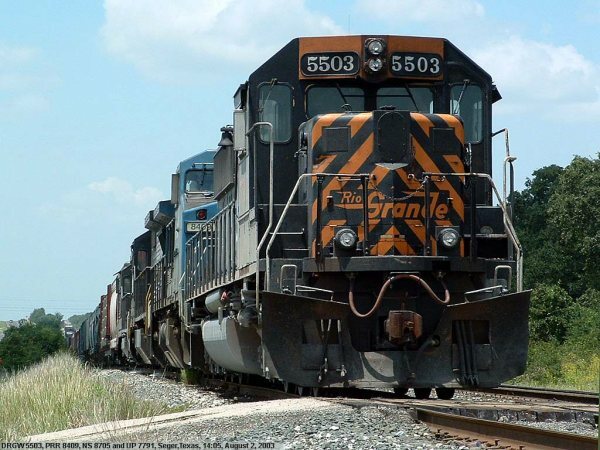 SP5511 was patched to UP 5105 around 12/10/01, then to UP 9855 on 8/15/02. SD50 No. 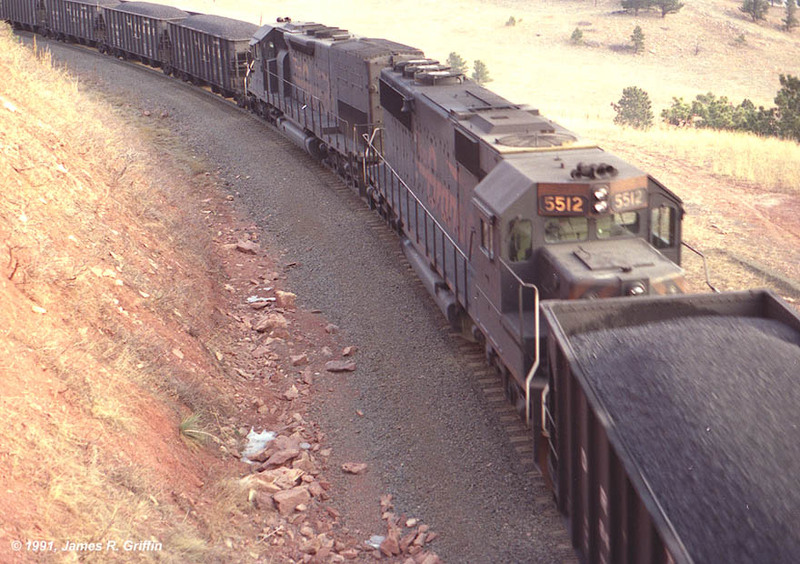 5512 — photographed Dec. 1991, when she was on the swing helper set of an eastbound coal train, diving into Tunnel One. 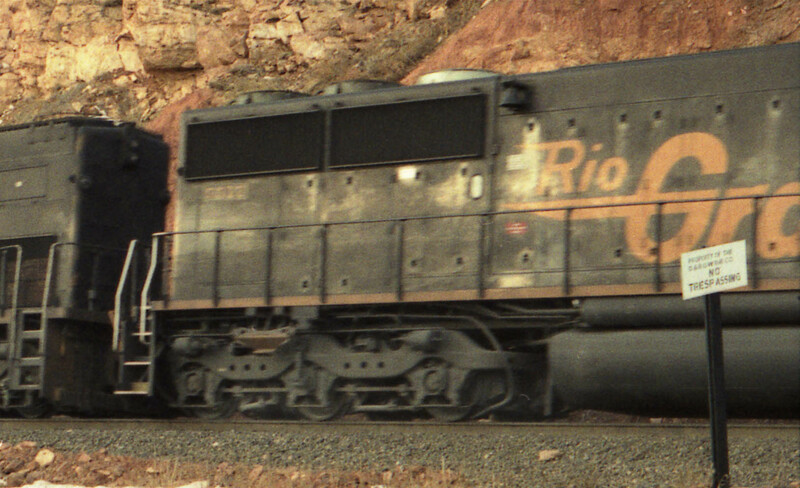 The 5512 was repainted as Union Pacific No. 5106. SD50 No. 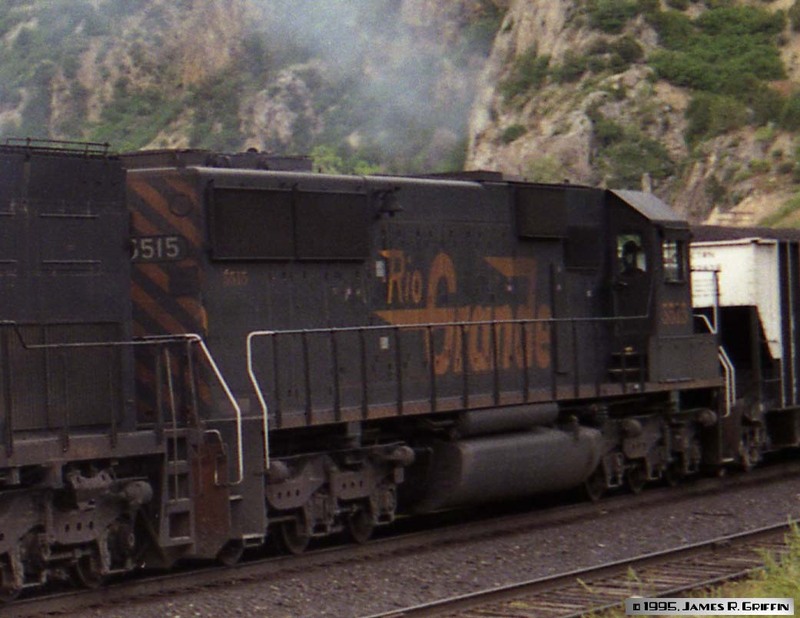 5515 is seen on June 29, 1995 leading a four unit swing helper on an eastbound coal train at Glenwood Springs, CO. Top image: approaching and passing the depot. Bottom: passing by and throttling up as they hit the canyon grade. You can see the engineer’s silhouette in this shot. The 5515 was repainted as UP 5109 on Oct. 3, 2001. Here’s the back half of SD50 No. 5517. Unfortunately I didn’t get the whole locomotive in this November 1991 shot (though I did get all of number 5395 to the left). You can see the high-mounted bell here, as well as the bundles of cable and piping below the frame. 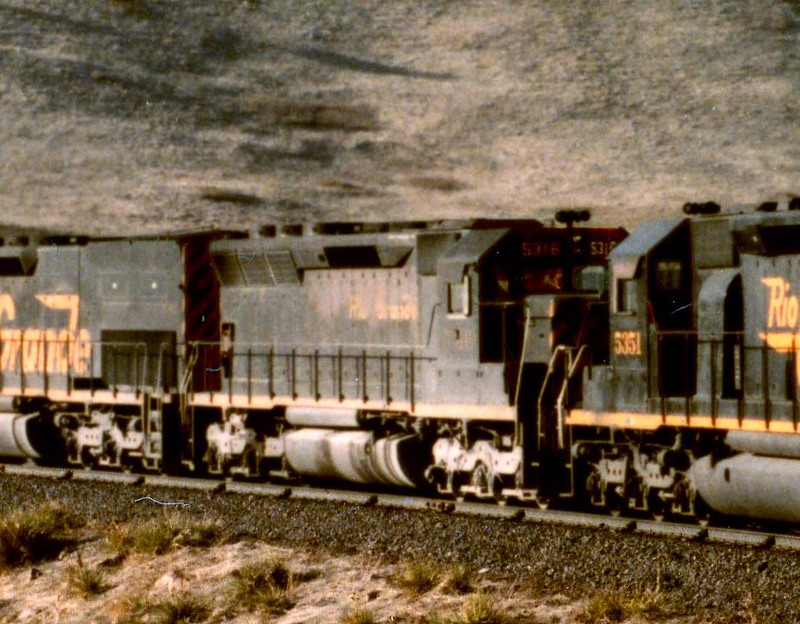 This unit was repainted into SP colors after the merger, then later received two different UP numbers before being retired.